It has been some time since the GTX 1080 Ti launched, although AMD is yet to come close to matching its performance with a card of its own. This has left board partners with a lot of time to engineer better and better cards to serve the lucrative high-end market, and MSI is one such partner. Its latest attempt is the GTX 1080 Ti Lightning Z. This £936 card, which will be limited to just 3,000 units, is described as 'built to be perfect'. That's quite the claim and quite the price; let's put it to the test. MSI's Lightning cards are nothing new. They traditionally come relatively late in a product's life cycle but with the promise of very high clock speeds, top notch cooling, and the latest features, and this one is no different. In terms of clocks, the card ships with 1,582MHz and 1,695MHz base and boost clocks respectively and memory that has been bumped slightly from 11Gbps to 11.1Gbps. The MSI Gaming App, however, can be used to set the card to Lightning Mode, whereby base/boost clocks are increased to 1,607MHz/1,721MHz with no change to memory. These are certainly high clocks as GTX 1080 Tis go, but there do exist a few cards with yet higher speeds. Note that MSI itself also has Lightning and Lightning X SKUs that differ to this card only by way of lower clock speeds – the Lightning Z is the true flagship. We've seen big GTX 1080 Tis before, but MSI has truly gone all out on size here. Measuring 320mm long, 140mm high, and occupying a full three PCI-E slots, this is not a card for space-conscious users. With die-cast cooler parts and an extremely bulky heatsink, it weighs a whopping 1.7kg and comes with a replacement triple-slot PCI bracket for extra anchorage – there's a real risk of damage to your motherboard with a card like this (even on reinforced slots) if it's not secured and supported properly. 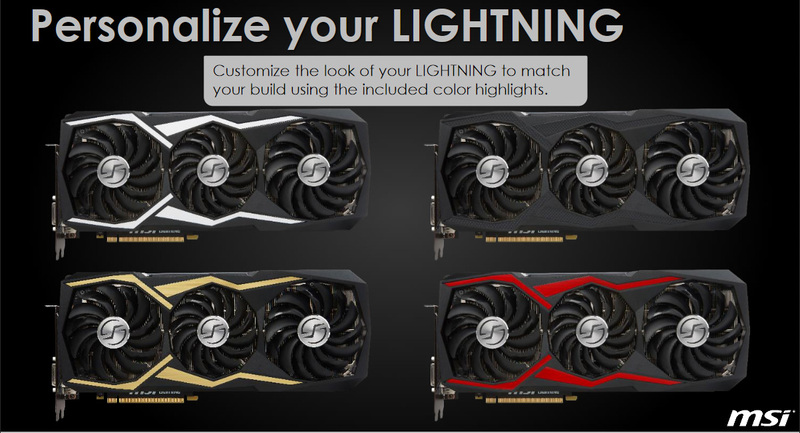 MSI has ditched the yellow and black colour scheme of previous Lightning cards in favour of a more neutral one that sees the mostly black fascia adorned with silver highlights. Stickers in the box allow you to swap these to red, gold, or black to better match your system, while MSI has also gone to town with its RGB lighting offerings. The clear strip along the top edge of the card as well as the backplate are backlit by dazzling LEDs set by default to a rainbow effect to truly show off the colour possibilities, but they are easily set to a whatever colour or effect you want with the Gaming App. Mystic Light support also means that the RGB LEDs can be synchronised with compatible hardware from MSI or other manufacturers. Display outputs deviate from the reference ones in the common way with MSI having swapped one of the three DisplayPorts to a second HDMI 2.0b connection to better support VR setups. 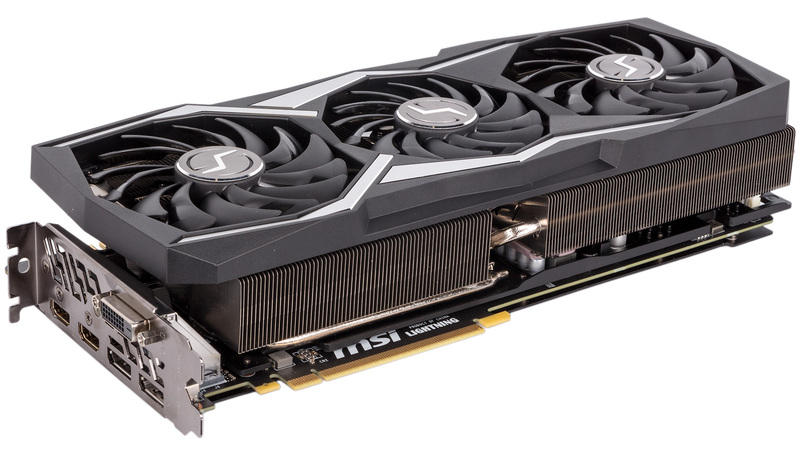 MSI makes a big deal about how this card is built for overclocking, and the most obvious sign of this is the trio of eight-pin PCIe power connectors slightly indented along the top edge. This means you can provide up to 450W of additional power to the card – far more than any overclock will ever need, even with sub-zero cooling. A single six-pin to eight-pin PCIe adaptor cable comes with the card. Further bolstering the theoretical overclocking potential, the custom PCB plays home to a massive amount of VRM circuitry with a whopping 14 GPU power phases complemented by three for the memory. The latest MSI Military Class 4 components are used here (with MIL-STD-810G certification), including DrMOS 60A MOSFETs, Hi-c CAP capacitors, and Super Ferrite Chokes, which all come with the usual claims of superior efficiency, power delivery, stability, lower operating temperatures, and so on. In case it wasn't already obvious, this is not a card built for your Average Joe. Extreme overclockers looking to break performance records are within the niche target audience here, and the dedicated LN2 mode switch beside the SLI fingers confirms this. Switching to LN2 mode disables the card's onboard current, power, and thermal limitations that traditionally stop regular users from breaking things. If you're pouring liquid nitrogen onto your components, that's not really a concern, and this switch saves you having to do physical modifications. In a similar vein, MSI has built in a trio of readily accessible voltage check points on the right side of the PCB for monitoring GPU, memory, and PLL voltages. It supplies a couple of cables for using these connections too. With the latest beta version of the MSI Afterburner overclocking utility, you also have direct digital voltage control not just for the core but also for the memory and two auxiliary onboard voltages which we're told control the PCIe bus voltage and that of the channel between the GPU and memory. Sensors on the card also allow Afterburner to report more temperature readings than usual. Again, all of this is really about making the lives of extreme overclockers easier. While we suspect that most of the 3,000 units produced will spend much of their time being cooled by liquid nitrogen, MSI has still produced a monster air cooler. The PCB is sandwiched between two metal plates, both of which have integrated heat pipes (yes, there's a backplate heat pipe). These add rigidity as well as boost heat dissipation, with the one on the front of the PCB covering practically the entire area and thus all VRM and memory components. The main heatsink is the real beast, featuring a nickel-plated copper baseplate that feeds six heat pipes (two 8mm, four 6mm) and two separate, densely packed fin stacks. MSI claims that this heatsink has an area that's almost 55 percent larger than the cooler on the Founders Edition card – something we have no trouble believing. The entire apparatus is cooled by a trio of fans – one middle 92mm flanked by a pair of 100mm models. These are all MSI's Torx 2.0 fans that have alternating blades and double ball bearings. The company's so-called Airflow Control Technology is implemented, which is essentially a means of shaping the fins so that air from the fans reaches the heat pipes more efficiently. The cooler shroud is very open, so practically all heat from this card will be recycled into your case.